This poor lamp was ravaged by the salt air of sea side living in Florida. Now I realize these are not glamour shots but, I was working under difficult conditions. This sweet Lamp was used to stage a home I was tasked with getting ready For Sale in less than two weeks. The lamp was in the home as you see it in the before getting ready to paint. I bought two types of paint the gray that I decided to use the Bronze hammered. I did not use it in this project. to fast. I set out the table cloth which kept blowing around hence the messy pictures. Time was of the essence so moving on I gave the lamp a quick sanding to remove any grime that would affect the paint adhering. Following the instructions on the can I shook the can and sprayed the lamp. Be careful to start spraying before and after the you pass the piece you are spraying to keep from getting drips. I also mentioned the wind and this can complicate spraying paint because it also goes where the wind blows. This is another reason I tucked my project in the carport to shelter the lamp and me from the wind. This is one coat and done. My plan was to keep the glass table clear. The lamp would not separate it was rusted together. I decide to see what happened if I painted it all. I was pleasantly surprised. Sometimes the twist of a project turns out best. Yeah!!! Now this Lamp dressed with her shade is as pretty as a picture and ready for a new home owner to enjoy. 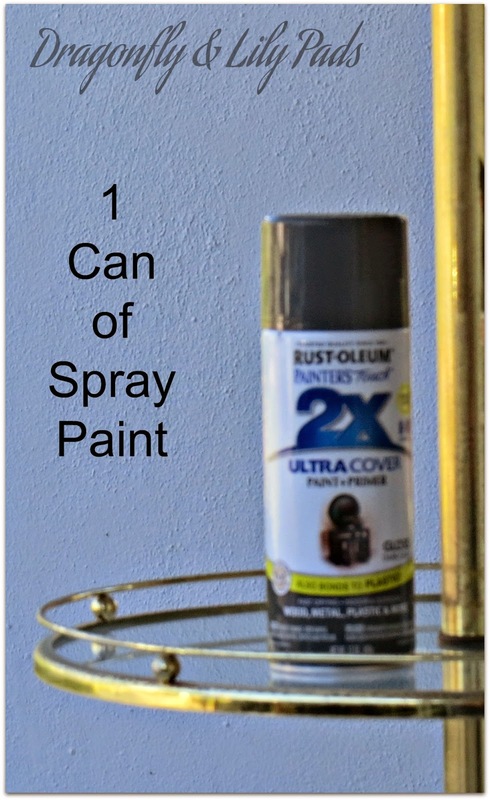 I am impressed with the +Rust-Oleum 2 X Coverage Paint. This paint was a huge time saver and the finish came out perfect. I would recommend this product. This is not a paid or sponsored endorsement and is not a warranty of any kind. I am simply stating I used the product, on my own and the application I used it for it worked out great for my purposes. Hi Karen! Love the makeover on the lamp. Sharing today over at Denise Designed. Appreciate you! Have a fab weekend. 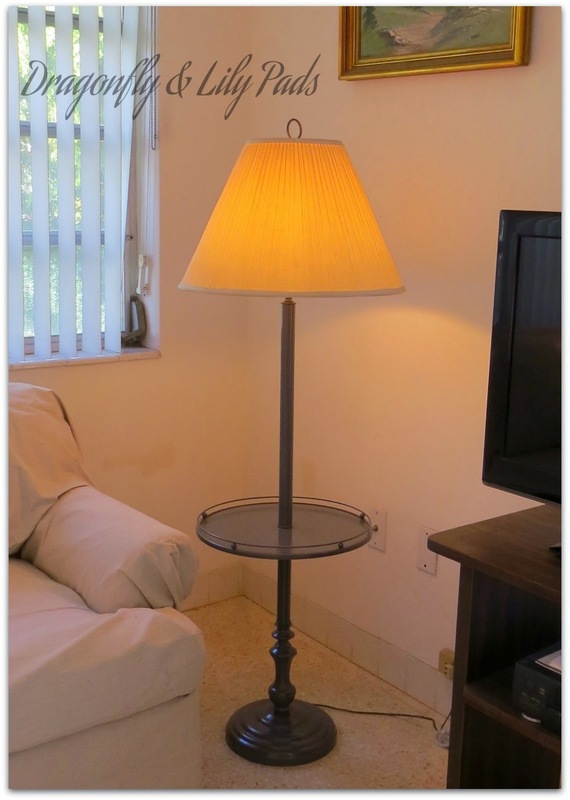 Thank you so much for visiting and sharing my Lamp make over. You made my weekend. Gorgeous! I love saves like this Karen Marie!! Oh WOW! What an amazing transformation!!! I love the color as well! One of my goals this summer is to find some old lamps at yard sales and give them a face lift. It looks pretty now. Great makeover! Thank you for stopping by to visit and sending love my way. Looks so nice - you did a great job! Love it! Very pretty- it turned out beautifully. Absolutely love this makeover! You have mad skills! This turned out great and it saves so much money when you can bring life back to a piece that you already love. It's always nice when you can rescue a rusty has-been!! Turned out great! Great idea! 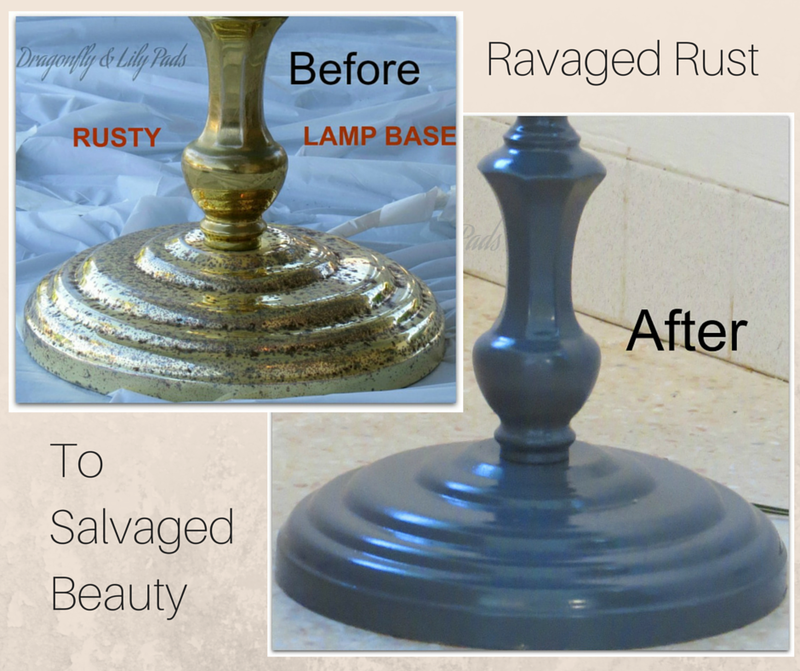 I love the after so much more and what a way to salvage a beaten up lamp :) So easy! I love how the lamp turned out! I personally would choose a new lamp shade but I love the color and look of the stand! Go for it Girl. I was happy with how quickly and nicely finished this project turned out. Thanks for visiting Come back soon. Thanks for stopping by and leaving a lovely compliment. It lets me know I am heading in the right direction. Come back soon. Thank you for stopping by today and leaving such a nice note. Come back soon. I am so glad you thought the lamp is pretty. Thank you for coming by and leaving a sweet note. Come back soon. I absolutely love that I have mad skills. You are too kind. I welcome you back soon girl. 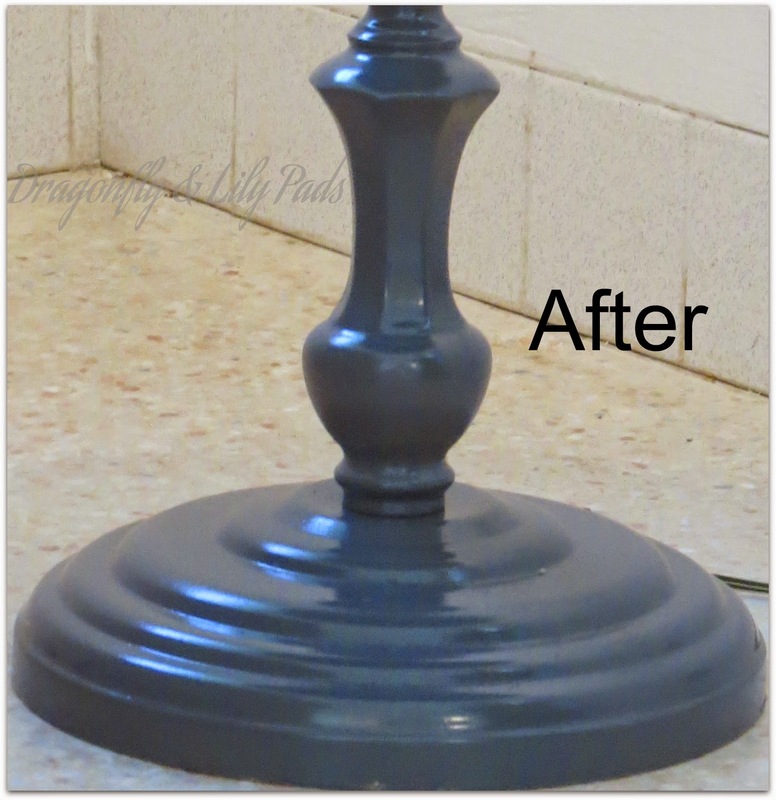 It is amazing what a can of paint will do for a sad lamp. Thanks for stopping by to share your kindness. Please come on back soon. Bring old things back to life is fun. Thank you for visiting today and leaving such a sweet comment. Come on back soon,. I am so glad you like the lamp makeover today. Thank you for taking the time to leave a lovely note. Come back soon. Thanks so much for taking the time to let me know you liked my Lamp project. I invite you to come back soon. I appreciate the constructive comment. I would agree with you on the lamp shade. This was to sell a house and I am not keeping the Lamp but could not leave it like that for staging purposes. So Design on a dime. I am glad you liked how the lamp came out. What lampshade would you choose for this lamp? Come back and share soon. The lamp looks so pretty painted. 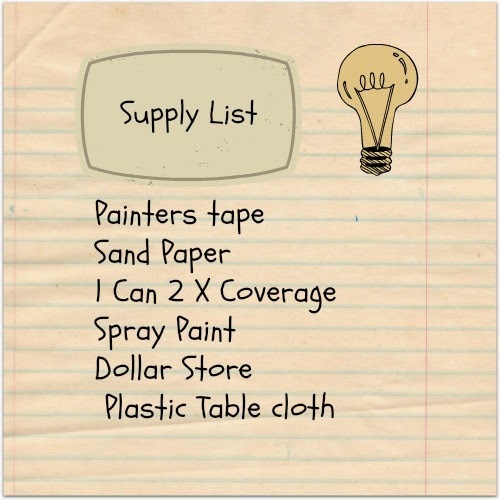 I have a few painting projects that I hope to do at some point, but will not need to wait until the weather gets a bit better. It is good to know you can paint this kind of lamp, because I had not thought about doing that before. Thanks for the thoughts Pam. Pleas come back and visit again soon.I would love to see how your painting projects turn out. Amazing job with the lamp! I agree, the dark color looks perfect with the glass table!